The sacred city of the Itza, called Chichen-Itza (chee-chehn eet-sah) in Maya, is located 75 miles east of Merida, the Capital of the State of Yucatan, Mexico. 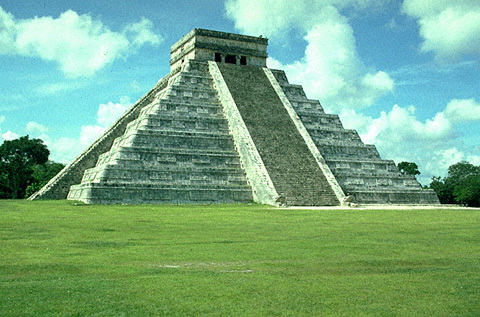 Chichen Itza are divided into two groups. One group belongs to the classic Maya Period and was built between the 7th and 10th centuries A.D., at which time the city became a prominent ceremonial center. The other group corresponds to the Maya-Toltec Period, from the later part of the 10th century to the beginning of the 13th century A.D. This area includes the Sacred Well and most of the outstanding ruins. The main buildings in the central area, including the Pyramid of Kukulkán, the Temple of the Warriors and the Ball Court, are Toltec in design and influence. There are also in Chicchen Itza Temple of the Jaguars and the Tzompantli , Sacred Cenote , Group of the Thousand Columns , and the Caracol.